Daniel Dendler (left) talks with pilot Sean D. Tucker prior to their Thursday morning flight. Arcanum resident Daniel Dendler (right) gives an in-flight thumbs up with air show pilot Sean D. Tucker at the Dayton Air Show Thursday. Dendler was the winner of an essay contest. Daniel Dendler (left) is all smiles upon landing. The Arcanum resident was allowed to man the controls two times during his flight. 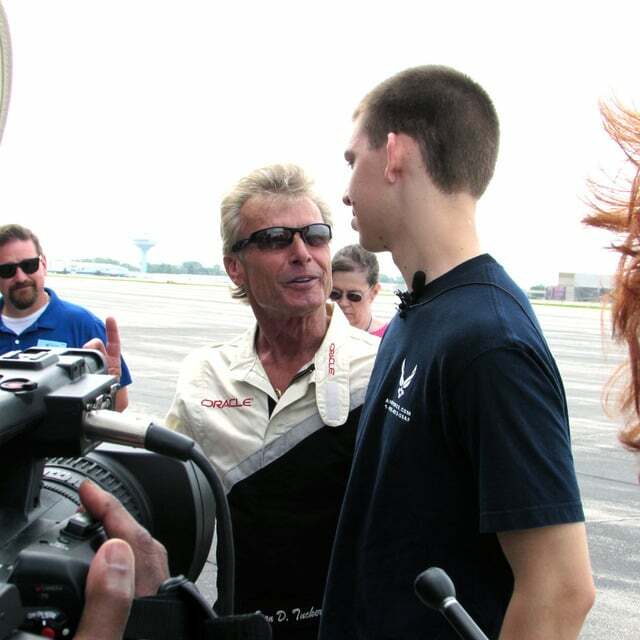 Pilot Sean D. Tucker and essay winner Daniel Dendler speak with the press following his flight Thursday. These confident, enthusiastic words were uttered by Daniel Dendler, 17, of Arcanum, when asked if he was ready for a second flight. An essay written by Dendler earned him the opportunity to soar among the partly cloudy skies Thursday morning at Dayton International Airport in Vandalia, now in preparations for the annual Dayton Air Show this weekend. Sean D. Tucker, pilot and chairman of the Experimental Aircraft Association’s (EAA) Young Eagles Program, took Dendler on a flight in a two-seat Extra 300 L aircraft. The propeller-driven plane was piloted by Tucker with Dendler occupying the front seat. Three media members and Dendler’s father Bill flew in a companion plane to cover the event. One of 27 local youths who submitted essays, Dendler’s piece was chosen as the winning entry, earning the young man an opportunity to spread his wings for real. During the flight, Tucker and his passenger executed a number of acrobatic maneuvers, including barrel rolls and flying upside down, often leaving a smoke trail in their wake. The flight lasted approximately 30 minutes. Following the flight, Dendler spoke to the press gathered to cover the event. His excitement was evident. “Flying upside down was really cool. That was a lot of fun,” Dendler said. “It’s weird to see all the streets I’ve driven my entire life, from being around here because this is where I grew up, and seeing them from the air is pretty neat.” he added. “It’s better than a day at work,” he said. Though he has previously been a passenger on commercial flights, this was Dendler’s first flight in a plane of this size. Dendler has enlisted in the United States Air Force and will enter the service next July after finishing his senior year at Arcanum High School. He will initially train for military security but eventually hopes to receive an officer’s commission and become a pilot. The Young Eagles Program is for children ages 8 to 17. For more information about the Young Eagles Program, visit the EAA website at www.eaa.org.